You'll no longer have to worry which way up your USB plug is when you blindly try to plug it in to the back of your computer. When you try to plug in a USB cable, you have just a 50% chance of doing it the wrong way, and having to turn it around. Why then, does it seem that we try to plug it in upside down every time? 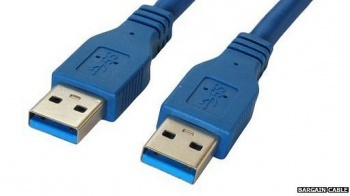 USB cable developers have sympathy for our pain, announcing that an upcoming version of USB 3.0 - USB Type-C - will feature a connector that is completely reversible. Hooray! Apple's proprietary lightning cable is currently already reversible, and this move will eliminate one of the advantages it currently has over USB. Other improvements coming with the new connectors include support for scalable power charging (allowing the cable to offer up to 100 watts), and data speed transfers of up to 10 Gbps, double what is possible at the moment. The Promoter Group, which agrees on the design of the standard, is currently made up of representatives from Intel, HP, Microsoft, Renesas Electronics, ST-Ericsson and Texas Instruments. "Consumers are now demanding thinner and sleeker product designs and the USB 3.0 Promoter Group recognizes this need," said the group's president Jeff Ravencraft. He added that the decision to make the new connectors reversible was "unrelated" to the Apple lightning cable. "This allows USB to increase performance and continue to deliver ease of use to several evolving product categories for years to come," said Roland Sperlich, from Texas Instruments. From mice, to microphones, to smartphones, USB is without a doubt one of the most common connectors we use in our lives. Nice to see that it's still moving forward, and finally eliminating some of those niggling issues that have plagued it for too long.